AMUL ranked as Number One Indian brand in Asia Pacific ! AMUL has done it again – It has been voted as the Number 1 Indian brand in Asia – Pacific. Branding of Amul is completely different than any other traditional brand that you encounter. Their branding budgets are far less than many other companies, still there is hardly any Indian who is not aware of Amul ! Amul has bagged this honor for second year in a row – Last year also, Amul was ranked as the number one brand in India. It is also the top dairy brand in whole of Asia-Pacific ahead of much bigger conglomerates like Kraft, Dutch Lady, Dumex, Walls, Anchor, Magnolia and Everyday. The rankings released by Hong Kong based “Media Magazine”, ranked Amul 73rd in Top popular 1000 brands in Asia-Pacific ahead of other Indian brands like Kingfisher (# 140), ICICI Bank (# 182), State Bank of India (#226) and Tata (# 256). Amul also managed to improve its rating by 10 points compared to last year when its ranking was 83rd. Its interesting to note that Amul is seen very less on tradition media outlets like Television and Newspapers. However, their hoarding Ads are a real treat to watch. They pick-up the most buzzing current topic and integrate it with their Brand Amul and come out with some really funny and catchy hoardings. Some of them are real classics ! Imagine that AMUL has kept the traditions of this hoardings for past 35 years ! I think they have been registered in Guinness Book of world records for longest running Ad campaign as well ! They are a real treat to watch, ain’t they ? Lifestyle Inflation – Is it Borrowed from the West? Can BRIC Economies forge a New Global Reserve Currency? 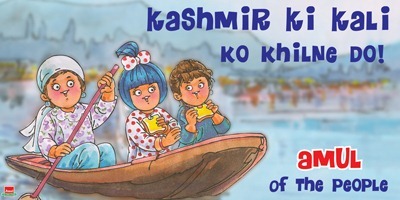 What can I say about Amul? Well, not about its brand campaigns. But, product quality. Yes, I believe its is one of the top most brands which sells products of utmost high quality at most reasonable prices in the market. Take, for example, Amul butter. It, undoubtedly, is a homely product. It is not less a commercial success as well. Go to any Pav Bhaji stall – they will ask you ‘Saada chahiye ya Amul walla? (Wanna local oil-clad or premium butter loaded). And, you know what we confide into. I am not sure whether Amul ice-creams are available universally across India. But, if there is one available in your nearby stores, don’t miss to savour the oldie Amul Butterscotch flavoured ice-cream, mostly available in family packs. The only problem with Amul ice-cream is that they are soft and melt quite fast. I donno whether this can be termed as a genuine problem or not. No, you’re mistaken if you feel that I am comparing Amul brands with other top branded products available in the market. Over here, I mean to say Amul products cater with best possible quality with most reasonable prices affordable to a common people. Also, your example of Amul Pav Bhaji is classic example of mind-share that Amul has developed amongst a Billion Indians ! 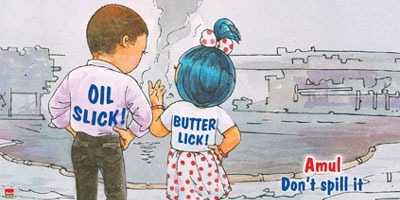 i’ve been a big fan of amul, as a company, & not only its branding stuff!! it’s been innovative w/ its co-operative structure @ a time when the concept was nascent!!! Dr. V. Kurien & Amul’s is one of the most inspiring stories ever! i will be reading his ‘i too had a dream’ soon………, & theres one more book of his,if i am not mistaken, something like ‘an unfinished dream’! Amul have advertised on TV at some point of time, cause I remember some Utterly Butterly girl ads, I wonder why they dont do that anymore… I am sure it would really increase the excitement about those ad hoardings..
i dunno if tht would be a good business sense……….if i compare the cost involved in hoarding w/ those of TV ADS….includin’ production, animation & what not………..they don’t really need it! besides, i never found any of those ads as effective as these classic ones,……..& if i’m not mistaken, the ads were never made around a buzzin’ topic, those were general!!! 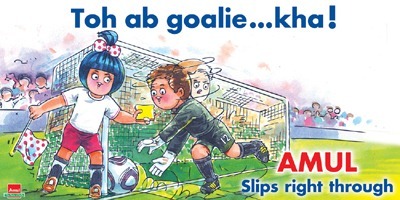 i have been loving all the amul adds since school days.. They used to keep on changed the cartoon adds every friday on the latest issues and it was fun reading them.. No doubt amul is best company and the products of amul are awesome..